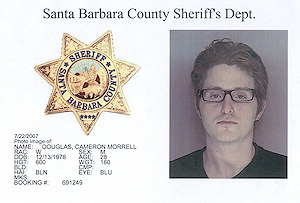 Michael Douglas' son Cameron has been ordered to stand trial on cocaine possession charges. At a pretrial hearing today, a judge upheld charges of felony possession of a controlled substance and misdemeanor possession of a hypodermic needle against Cameron, 28. His friend faces the same charges. Cameron has also been charged with being under the influence of a controlled substance. The charges stem from their July 22 arrest, when police found a syringe on the floorboard of the car Cameron and the friend were in. Cameron appeared alongside his father and grandfather Kirk Douglas in the 2003 film "It Runs in the Family."